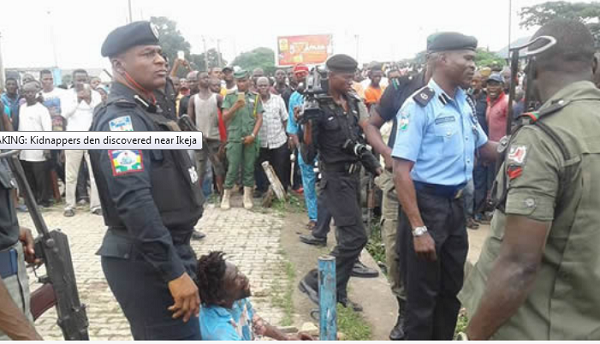 Police Uncover Suspected Kidnappers Den Near Ikeja. Another discovery of suspected kidnappers’ den at Ile-Zik on the busy Lagos/Abeokuta Expressway,Lagos state and Earlier this week, two suspected kidnappers were killed by a mob around Ajala Ijaye as residents resorted to mob action to combat the threat. On Thursday 10th of August, Small crowds milled around both sides of the expressway as police vehicles descended on the area. Reports gathered that security operatives found human parts concealed in some bags in the place after they were alerted by concerned residents who had picked up a strange fellow with clothes, suspected to be a kidnapper. The area is said to have underground tunnels where kidnappers are believed to hide their suspects and human parts.